Our next major project is centered on making East Market Street a major connector between Warsaw and Winona Lake. This involves making the street usable and enjoyable for everyone. During street reconstruction, we will partner with the community to develop a multi-use trail. Concept – The ability to choose a healthy lifestyle is fundamental for community success and happiness. This project is part of our effort to encourage such lifestyles by providing safe and convenient routes for recreation and active transportation. It will provide a shared trail and new sidewalk on Market St from the Krebs Trailhead to Bronson St. 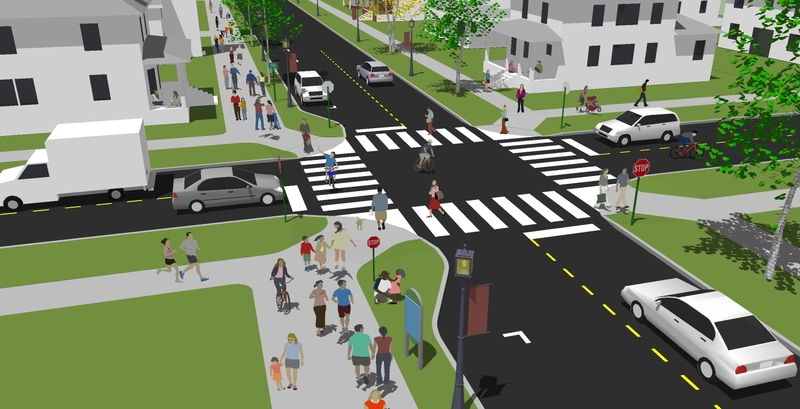 The Market Street Trail will strengthen connections between the Town of Winona Lake, Downtown Warsaw, Market street neighbors, and three parks. This will also connect the Greenways with a cross town trail and become the center of our trail system; indirectly connecting every major trail and many more schools, parks, and homes, while greatly improving quality of life and place. Benefits – Those who use the trails will feel comfortable and be safer. Those who can’t will benefit from fewer cars on the road. Property owners will benefit from increased property values, and businesses benefit more from trail users because they stay longer and spend more. Trails also reduce accidents by raising awareness and lowering speeds. Project Details – The City has begun engineering work on E Market Phase 1, from Argonne Rd to Bronson St. Street and utility work will begin this year. Completing trail work during the project will result in significant cost savings. E Market Phase 2 will complete the route, extending from Bronson St to Downtown, and all work including street reconstruction and trial work is fully funded through an 80% matching State grant of $1.7 million. We are seeking partners for the trail and amenities on Phase 1. The K21 Health Foundation has already challenged us with a matching grant, awarding us $375,000 if we are able to raise community support with a $125,000 match. We need community support to realize this goal and complete this core project of our trail system. If you are interested in contributing, get more details here.